Community banks have increased lending to community developers and homebuilders but are exposed to risk above regulatory guidelines. Investing in community banks, or those banks involved in the construction of communities, homes and commercial property on Main Street USA, isn't as simple as it may seem. But here's how. One of the most important news releases each quarter is the FDIC Quarterly Banking Profile; the latest data is for the second quarter of 2015. Investors should consider this data from the Federal Deposit Insurance Corporation as the balance sheet for the U.S. economy. Real estate is a key segment of the economy, and smaller banks, known as community banks, are in business to provide construction and development loans, or commercial real estate loans. Community banks do not benefit from higher interest rates. These banks have increased their holdings of long-term assets, while long-term funding has not grown at the same pace. According to the FDIC quarterly banking profile, a rise in short-term rates could result in funding costs rising at a faster rate than the yield on longer-term assets -- putting pressure on net income margins, known as NIM compression. Here are the loan categories to worry about when investing in community banks. Construction and development loans are loans to community developers and homebuilders to finance planned communities. This was the Achilles Heel for community banks, and the major reason that more than 500 banks were seized by the FDIC since the end of 2007. The recovery in this real estate loan category has been solid in recent quarters. C&D loans were up 3.9% in the second quarter to $255.8 billion. As an indication of continued stress, C&D loans are still down 59.3% since the end of 2007. The commercial loan category includes the C&D loans and loans to construction companies and homebuilders to build office buildings, strip malls, apartment buildings and condos. These have been a major focus for community banks. This category of real estate lending held up well during the Great Recession. Commercial loans were up 1.1% in the second quarter to $1.18 trillion and are up 21.4% since the end of 2007. Back in the fall of 2005, the Federal Reserve, U.S. Treasury and the FDIC realized that community banks were loaning funds to the housing and real estate markets at a pace above what these regulators thought as prudent. Staffers at the FDIC were warning about this overexposure as early as 2003, but the FDIC let the party roar on. New guidelines were formalized by the end of 2006 and included the following stipulations. The first guideline seeks to prevent overexposure to construction and development loans. If loans for construction, land development, and other land are 100% or more of total risk capital, the institution is considered to have loan concentrations above prudent risk levels, and should have heightened risk management practices. The second guideline tries to stop overexposure to construction and development loans, including loans secured by multifamily and commercial properties. If loans for construction, for land and land development, and for multifamily and commercial property are 300% or more of total risk capital, the institution would also be considered to have a commercial real estate concentration above prudent levels, and should employ heightened risk management practices. Even as the subprime mortgage problems began to surface, these regulators shrugged them off saying that subprime issues would be contained and not spread to the rest of the economy. Here's a table of FDIC data that shows these exposures for 14 publicly traded community banks. Banks that are overexposed to both construction & development and commercial real estate loans include BNC Bancorp (BNCN , Cardinal Financial (CFNL , ConnectOne Bancorp (CNOB , Green Bancorp (GNBC , Home BancShares (HOMB , Bank of the Ozarks (OZRK and Texas Capital Bancshares (TCBI . BNC Bancorp, Cardinal Financial, Home BancShares and Bank of the Ozarks should be sold, as each set multiyear highs on Wednesday. Texas Capital Bancshares should be sold as it has approached its June 26 high. There are three banks that are overexposed to commercial real estate loans only; Investors Bancorp (ISBC , PacWest Bancshares (PACW and Umpqua Holdings (UMPQ . Four community banks without these loan overexposures are Commerce Bancshares (CBSH , Handcock Holding (HBHC , Northeast Bancshares (NWBI and Old National Bancorp (ONB . Let's look at the weekly chart for the ABA Community Bank Nasdaq Index (ABAQ). There are 354 publicly traded banks in this index. Before the financial crisis, membership was limited to 500 banks and there was a waiting list. The community bank index set its all-time high of 315.05 in December 2006. 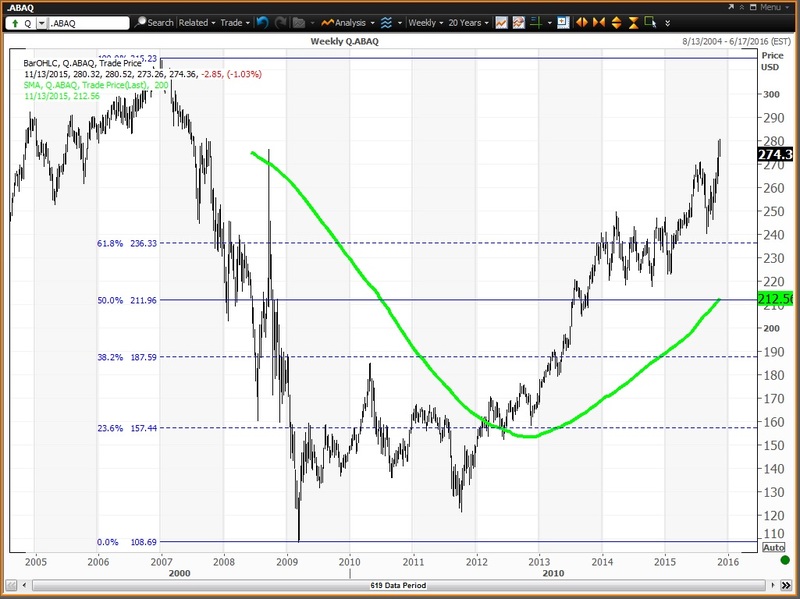 Then came the crash of 2008 and the index bottomed at 108.55 in March 2009. The spike higher shown in September 2008 occurred when regulators banned short-selling. This strength resulted in a selling opportunity for those long to get out as the index failed at its 200-week simple moving average, then at 270.25. The horizontal lines are the Fibonacci Retracements of the decline. Notice how the index traded around the 61.8% retracement of 236.33 between November 2013 and March 2015 when the latest run-up began. Bottom Line: Higher interest rates and increasing exposures to construction & development and commercial real estate loans are reasons to reduce holdings in community banks. The downside risk is at least back to the 61.8% retracement, given the fact that single-family housing starts are about 60% of potential and that new home sales lag even more. An increasing inventory of new homes for sale will delay repayment of these loans. One final point is that the community bank index might not return to its pre-crash high, while the S&P 500 traded 35.5% above its pre-crash high at its all-time high of 2,134.72 set on May 20.